Kuro, a little tomboy garbed in pitch-black with a little-tomboy-sized coffin on her back, heads out on a journey to find a certain witch. In the company of her faithful bat friend, Sen, Kuro encounters all manner of people and places along the way. Told in 4-koma (four panel) style and peppered with full-color pages, Satoko Kiyuduki’s debut captures all the whimsy of the most memorable fairy tales! 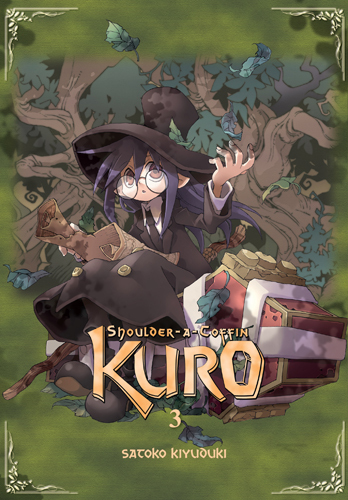 Regularly mistaken for a boy and/or vampire, the traveler Kuro roams the land, clothed in black from head to toe, a Kuro-sized coffin on her back. Accompanied by her snarky bat friend, Sen, the mysterious duo meets all sorts of individuals en route — some good, some evil, some just plain crazy! But Kuro never stays in one place for long, begging the question: What exactly is she searching for? And what exactly does she intend to do with that coffin?! With Nijuku and Sanju in tow, the road winds on for Kuro and Sen. During a lull en route, Kuro takes a turn down memory lane, revisiting an unfortunate incident during her early days as a traveler that resulted in her imprisonment! One by one, the secrets surrounding Kuro and her journey with Sen are disclosed…and the fate that Kuro will suffer should her quest fail is finally revealed! Still in search of a way to break the curse cast on her by a witch, Kuro continues on the winding road of her travels. At every turn, she and her colorful band of companions encounter the peculiar and the mysterious—a girl who lives inside the mirrors at a mansion in the woods; a wind-up woman in a dark forest; a tree that grants wishes for a price; a patchwork witch basking in the sunlight filtering through the trees. What curious fellows and wondrous things will Kuro’s journey lead her to next? And can any of them provide Kuro with the one thing she really wants before her time runs out?